Lately, whenever I say to someone, “Oh, check the library.” I get this look, followed by something close to: “My library never has anything I want.” I’ve taken notice because I find myself telling people to go to the library more and more often these days. I can’t really blame them for their opinion on the library though, after all up until about a year ago I hadn’t borrowed a book in a decade. Let’s be clear, that doesn’t mean I hadn’t read a book in decade, but simply I had been buying them instead of going to the library. Then, suddenly (sooo not suddenly), my Brooklyn apartment felt full to bursting with books and I decided I had to make a change. I went into purge mode. I found a place to donate books. Some friends were even inspired to pare down their own collections. I set a strict rule that any book that stayed was 1) something I loveLOVED and 2) was in a desirable format; everything else had to go. And this extended to all the books in my house including graphic novels, comics, and manga; everything had to be reassessed. After I decided to change my habits, I had to figure out a better way to acquire new material without filling up my house again. Because, let’s be honest, there was no way I could have stuck to my plans if I didn’t have a place to read new things. The library saved the day. The library is amazing. The last time I used the library for anything besides college studies was long, long ago. The method was completely different, the technology was nowhere near as advanced, and the way I found books was simply to go in and look around. Now? The library is like Amazon but free. All the books in all the library branches of your city are at your fingertips to browse on the library website. The listings have all the trappings too: cover image, summary, author information, and library records. You can find out how many copies of any book are available, where they are, or if holds have been placed. Users can rate, tag, and review any book. The site has a list of what new books have just come in. You can see what books are on order or request books that have been overlooked. All of your records are there for you to review, too. You can make a shelf so you know what you’ve completed or what you want to read. You can create lists of titles. You can share or not share things with the community, and you can Tweet or post right to Facebook like so many other sites. See a book in the system you want? You can place holds on up to 10 books at a time then have them sent to whatever your preferred branch is. When they arrive at your branch? You can have the library system send you a text, or an e-mail, or you can just check the website. Do they have manga/comics/graphic novels? Yes, everything from Attack on Titan to Sakuran, from Ultimate Spider-Man to Mouse Guard, from Scott Pilgrim to Castle Waiting. Do they have long-running series? Yup, get your One Piece fix! Do they have the latest volumes? Sure, I have Kimi ni Todoke vol. 19 on hold. I can search for “Shojo Beat Manga” or “Marvel Now” or “Psychic Ability — Comic Books” in the public library system, these are suggested search terms. Granted the system isn’t perfect, some volumes in a long-running series may not have all the same tags for example. However the title search will work just fine for such things. The point is, the amount of effort put into their comics collection is pretty astounding and it is growing all the time. The fiction collections are, unsurprisingly, even more vast. New books are continuously being entered into the system, and I take full advantage of that. I haven’t used the DVD service too much, but I can tell you they have more Adventure Time than Netflix. Does the library have everything? Of course not. So, sure, some things go on my “to buy” list if I want to try them out. But I have something like a 75% chance of finding any book I want to read at the library. I keep a list of everything I want to read so I know it’s true. Now instead of the library being an after thought, it is the first place I head to when I hear about a book I want to read whether it is a novel or a manga. It needs to be noted that I am talking about the Brooklyn and Manhattan Public Library systems, which I am aware are possibly going to house larger and more diverse collections as well as have more up-to-date technology than other places in the United States. But my goodness, the library has really come a long way. I encourage everyone to stop assuming your library doesn’t have what you want and instead actually go to your library’s website and browse the catalog. Help your community; help your wallet. As a final thought, I didn’t slay my collector’s spirit; I don’t want to. I simply reined that desire in. No one would walk into my apartment and think I have left material possessions behind. Heck, anyone besides me walking into my apartment probably can’t even tell the difference but the difference is huge I promise you. And yet, I’m reading more than ever. As soon as they finish rebuilding my local branch I’ll have to give the library another go. And isn’t purging possessions therapeutic? I did it before my last move and it was great. I’m actually planning on doing it again because my apartment is filling up again. It should be noted that you live in New York City, and as such “all the books in all the library branches of your city” is going to encompass a much higher quantity and diversity of selection. Here in Florida, funding for our libraries has been largely eliminated, including much of the support necessary for inter-library loans to even occur. Sadly, you didn’t read my entire article before commenting. I don’t know about every library in every area obviously, but it is worth checking back. I took a quick look at Tampa and Indianapolis libraries to see if their catalogs worked similarly and they do. I read it all, but I think you’re misunderstanding what I’m saying because of the geographical issues. In Fl, there are multiple library systems/consortiums that don’t easily inter-loan between one another. You often need to now pay a fee; typically $10-$20, which with manga’s pricing means you may as well buy the book. Tampa, as an example, isn’t in the same system as Miami-Fort Lauderdale (where I’d be), so while it’s possible to get titles from them, it’s not practical. Much of the funding that was reduced/eliminated was for that aspect of it. True, if there are regional branches within my system that have things, ILL is still feasible. The problem then goes back to the selection issue I noted. The library’s a good option if you want to get caught up on Shonen Jump, but unless you live in a major metropolitan area the chances of being able to read say, a Vertical release, aren’t so good. My point was that you commented with “It should be noted” when I did note it. I am aware that around the country things will be different and sometimes difficult. I was hoping to hear more from people who use libraries elsewhere when I wrote the article. I’m sorry to hear about the state of things in some parts of Florida. And, strangely enough even in the city the library doesn’t carry a lot of Vertical release actually! 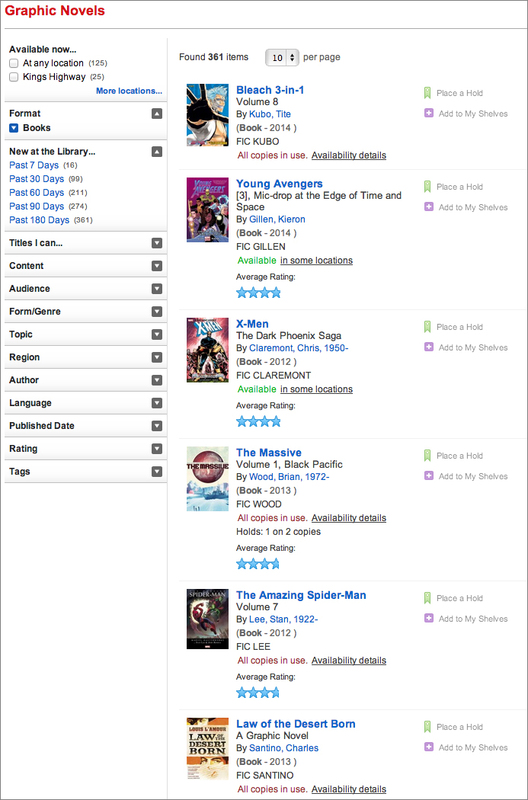 Manga volumes in my city’s library system — maybe other books too, I haven’t really checked — don’t have a “home” branch. They just get put on the shelves of whatever branch they were returned to last. I have had this happen too! Though in a way I wish it didn’t happen because that would mean more people were checking out those books! It’s important to note that aside from being able to search several libraries at once (which can encompass several towns in more rural or suburban areas) the reference Liberian can usually find you a book outside the system and get it through inter library loan. And your hold list is limited? I’m a bit jealous of that. The library I work at doesn’t dk that and son people really take too much advantage. .. Thanks Angela. I have been lucky with living in the city that I haven’t used inter-library loan. I am glad to hear that is an option for many people. But as Daryl pointed out, I guess this can be costly and then not really worthwhile for some books. The library is a treasure trove! Sure, we may be biased, but it delights us to read of people who have either discovered or re-discovered their public libraries. It truly opens up a whole new world of options and possibilities.